(February 28, 2015) Olympic had a BIG day on Wednesday! With a banquet room full of industry, government, economic development, and post-secondary education leaders, Olympic and Bosch Rexroth won the 2015 "Best Collaboration Award" for working in partnership to: 1) launch a new Advanced Manufacturing High School that addresses a local talent and skills gap; 2) create a new Advanced Manufacturing and Technology Center to expand high demand skills with youth; and 3) establish a FIRST Robotics Team that was the first CMS team to ever win a regional championship and advance to the International Championship Competition. Additionally, Olympic 2012 Graduate Rebeca Espinal won the "Student Academic Leadership Award." (2012 Olympic graduate Douglas Rodriguez was a finalist for the award as well.) This is the third year in a row that an Olympic graduate has won this academic award. Advanced Manufacturing Awards for the economic region are given annually by the Charlotte Business Journal and the Centralina Economic Development Commission. 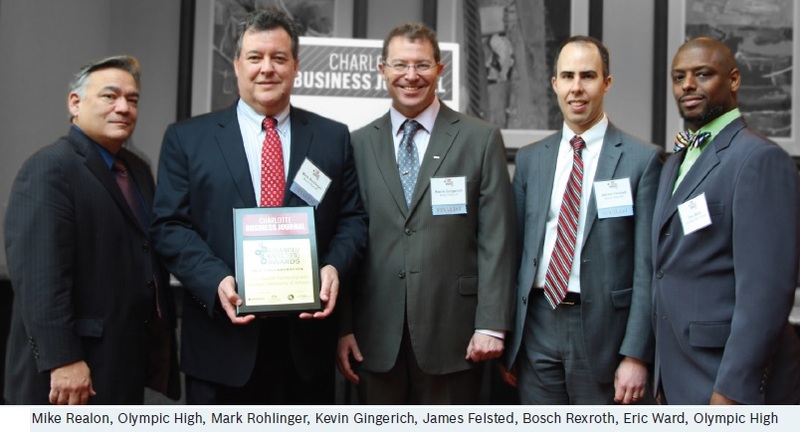 See Celebrating innovation at CBJ's Advanced Manufacturing Awards and Advanced Manufacturing Awards: Bosch Rexroth USA, Olympic High School from the Charlotte Business Journal. Jay Williams, United States Assistant Secretary of Commerce responsible for economic development, was the keynote speaker. He emphasized that increased collaboration, like that demonstrated by exemplars being honored Wednesday, was essential for advancing American prosperity in the 21st Century, especially increased middle class prosperity.